Since I was born, I have not seen a good and truly dedicated leader like Mazi Nnamdi Kanu, the supreme leader of Indigenous People of Biafra (IPOB). So, I want to use this opportunity to thank God for giving us a messiah in the person of Nnamdi Kanu, who has come to deliver us from the shackles of wicked and demonic Hausa/Fulani stooges that have been attempting to obliterate us from the surface of the earth, through the help of their western world counterpart - Britain. But Chukwuokikeabiama has been good to us as his children, because only He determined that we shall exist as a human race. The quality of leadership Nnamdi Kanu possesses is very hard to see the world over, especially in Africa where human brains need to be examined to know whether something is missing, considering how debased our mentality is. Oh, thank God for Nnamdi Kanu because many things that used to be taboo prior to his emergence have become cornerstone, desirable, and hope of the subjugated, deprived, and emasculated people of Biafra! Oh, thank God for Nnamdi Kanu, because without his emergence I would still be wallowing in mental slavery! 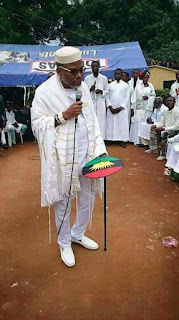 Without the emergence of Nnamdi Kanu I would still be singing songs of praise in my agony; I would still be attending independence day celebration every first of October in green-white-green attire, not knowing that I'm celebrating years upon years of bad roads, bad drinking water, poor power supply, dilapidated system of education, massacre, subjugation, intimidation, deprivation, misinformation, and third class citizenship. .Oh, thank God for Nnamdi Kanu! He is my saviour. Yes, he is my redeemer, for he redeemed me from eternal mental and spiritual slavery. Thank God for Nnamdi Kanu who is on the verge of delivering us from the hands of Hausa/Fulani spineless, godless, gutless group of communazi faggots, traitors and cowards, who are in control of this abominable contraption called Nigeria. Oh, thank God for Nnamdi Kanu, the chosen one who God sent to come and deliver his people from the hands of their killers, enemies, and uncircumcised Hausa/Fulani that have sworn to obliterate us form the surface of the earth! Thanks be to God that they will definitely fail like their forefather, Usman Dan Fodio. Before now, anyone that mentions or talks about Biafra was seen as a tout , jobless or even criminal; but now, he that talks about Biafra is cherished by the people and becomes the cynosure of gathering. Thank God for Nnamdi Kanu! Currently, Biafra is being preached in all corners of the world: in Churches, Schools, market places and all over the streets of the world. Thank God for Nnamdi Kanu. In the near past, one who wears clothes bearing Biafran inscription or hoists Biafra flag got apprehended by the government, or attacked by MASSOB for not being a member. Today, however, Biafra items outsell eatables like garri and are worn by IPOB members and non IPOB members. Oh, thank God for Nnamdi Kanu! Before now, anyone caught selling Biafra items was arrested, but that has changed today, as Biafra items are sold on the streets, roads, shops etc and such dealers record great sales, without any form of intimidation by the law enforcement agencies. Oh, thank God for Nnamdi Kanu! Yes, back then it was a taboo for one to be in Biafra T-shirt and cap, for everyone in it would become scared whenever police van passed. Today, however, I wear the Biafra T-shirt and cap, and even make use of the muffler, without fear of being seen by any police van. Oh, thank God for Nnamdi Kanu! In the past, news about Biafra only made it to the dailies when MASSOB paid. Yes, it was very difficult to read issues related to Biafra back then. Today, however, any paper that does not publish Biafra-related issues does not sell. It takes Biafra issues for the print media to make good sales. Oh, thank God for Nnamdi Kanu! In the past, only the aged were seen talking about Biafra, but that has changed today. The youths have taken over. Wherever youths are gathered today, Biafra is most likely the topic. It gladdens my heart that the youths of today are now at the helm of affairs, especially concerning our freedom. Who made all this possible? It is one voice that was transmitted by Radio Biafra, London, shouting that we either got Biafra or die trying. 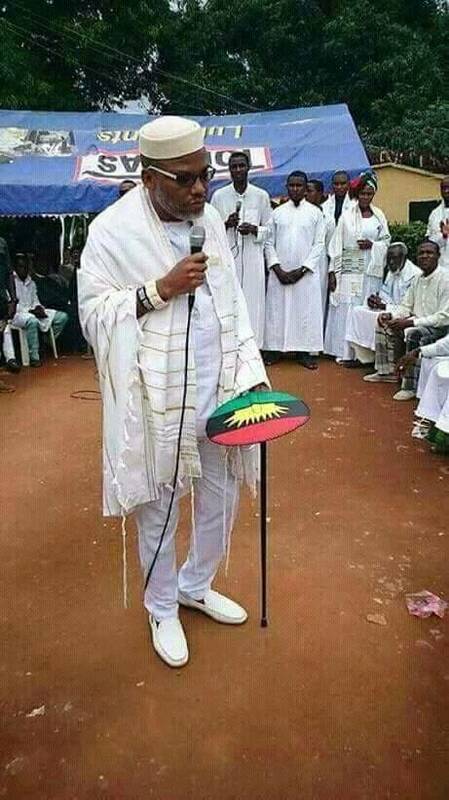 It was the voice of one man that hails from Isiama Afaraukwu, Ibeku, a prince whose name is Nnamdi Kanu. He is the lion that has chosen death instead of watching his people suffer in abject poverty. He dislikes oppression; he stands for fairness, equality and transparency. Truth is his watchword. He is a man to emulate, a beacon of love and wisdom. I love him so much. I thank God for giving us Nnamdi Kanu.